1 Once and for all, we can see for ourselves that there is no one way to mother, have a mother, love a mother, be a mother, or be mothered. All of our stories are of how to mother. 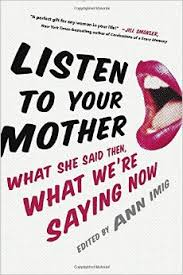 There are 56 fascinating ways showing us why, in the newly released Listen To Your Mother anthology. 2 If you love to get lost in the beautiful uniqueness of humanity, open up to any page in this gorgeous collection, and find it right here. 3 Mothering is never perfect, not always in style, and seldom right on track. But what it is here, is 56 true stories, the kind that will leave you thinking. 4 Where else can you be surprised by the human experience, just when you think you've heard every story possible. Find 56 extraordinary stories here that show you just that. 5 See how we survive what seems insurmountable, how we triumph what feels overwhelming, and how we celebrate the gift of life that we have. 6 Reading this book will make you realize it's the book you had no idea you needed. 7 Read along as we honor the role of mother, as performed by mothers, grandmothers, aunts, sisters, fathers, uncles, teachers, friends, neighbors, and all who have had a hand in nurturing us. 8 Mothering can be scary, intimidating, humbling, inspiring, and mind blowing. The words here will hold your hand along the way. 9 Watch as the stories here tell of becoming mothers, growing into the role, finding the footing, or missing a step. Cheer the writers on, and recognize your own path on this journey. 10 Do mothers wear heels? Or do their children cringe to see their out of date style? Do some mothers care? Do some children care less? What does a mother look like? And how does their child see them? These stories provide incredible introspective and heartfelt reading into who we are, and how we remember those before us. For anyone who has ever cared for a child, tended to a parent, wandered away from motherhood, and worked their way back -- this collection is a must have. A complete work of original essays, each one comprehensive, thought provoking, intense and insightful, and passionate in its writing. These essays wrap their arms around what “motherhood” means and expands the concept of mothering to include the striking reality of all experiences. Straight from the heart, don't miss the chance to read the newly released Listen To Your Mother anthology. I'll be giving away a signed copy on bonbon break Monday, April 13. Follow bonbonbreak on Facebook and twitter for giveaway details. You can find the LTYM book now on sale, at most book stores. Thank you so much, Cathy! I am in love with the essays. I ordered my copy earlier this week. Congratulations on being a part of such a wonderful movement. That's what it is, right? So much more than a book. THank you, my friend. I can promise you, the book is everything it was meant to be.